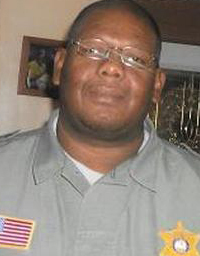 Deputy Sheriff Rodney Condall suffered a fatal heart attack in the Old Parish Prison as he and other officers rushed to help another deputy who had called for assistance shortly after 9:30 pm. He collapsed after rushing up a flight of stairs. Other officers and jail medical staff immediately rendered aid. He was transported to a local hospital where he passed away. Deputy Condall had served with the Orleans Parish Sheriff's Office for 16 years. He is survived by his wife and two children. Rest in peace Deputy Sheriff Condall.